Leading Manufacturer of total pillow, seat cushion, cervical pillow and yoko yoko neck & shoulders comfortable heat sensation from Chennai. One of the most impressive things that anyone can use when it comes to getting the body to feel relaxed and comfortable is the Total Pillow. This type of pillow is something that is designed in a very unique shape. It is used with a great build in mind as well. Here are a couple of great things to see with this top quality pillow in mind. The Total Pillow is a pillow that features a unique design to it. It features a series of segments all around it in a circular shape with a large dividing end at it. This is used to create a shape that is like a circle but is not completely enclosed. This is a comfortable shape to use with regards to body support needs. 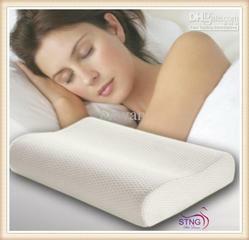 The build of the pillow will feature a soft and comfortable cover to it. This will help to keep the pillow relaxing and easy for any user to handle. 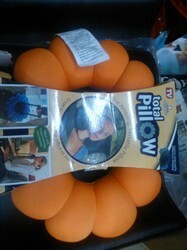 It will not be too difficult to take advantage of this enjoyable pillow feature. The pillow is incredibly easy to adjust. The Total Pillow can be bent into a number of different directions for any user's needs. This includes directions that relate to where the pillow will bend and how it will twist around. This is used as a means of allowing the pillow to support all sorts of places that are located all around the body. 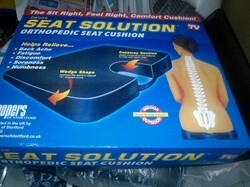 Seat Solution Ultra -Orthopedic Seat Solution Orthopedic seat cushion with memory foam. The sit right, feel good, comfort cushion. Seat Solution Ultra promotes proper sitting posture while relieving painful pressure on the lower back and buttocks. Dual sided microsuede faux leather. Now with memory foam for comfort. Furniture grade foam for support. Perfect for the car, home, work, sporting events and more. Helps relieve: Back Ache Fatigue Discomfort Soreness Numbness Features: Breathable microsuede side- keeps you cool and comfortable Water/Satin resistant faux leather side- just wipes clean Cutaway section- Eases pressure on the tailbone to help your spine Wedge shape- Restores the spine's natural "S" shaped curve 2 Layers of foam- memory foam for comfort and furniture grade foam for stability Built in handle for easy portability. Our customers can avail from us Cervical Pillows/Neck Pillows that are manufactured using premium raw material, obtained from the reliable vendors of the market. All our pillows are available in various sizes, shapes and colors at most competitive prices to fulfill the demands of customers. Looking for Neck Care Pillows ?